Kim Soo Hyun was interviewed by MBC variety show Section TV broadcast on March 4th, 2012. 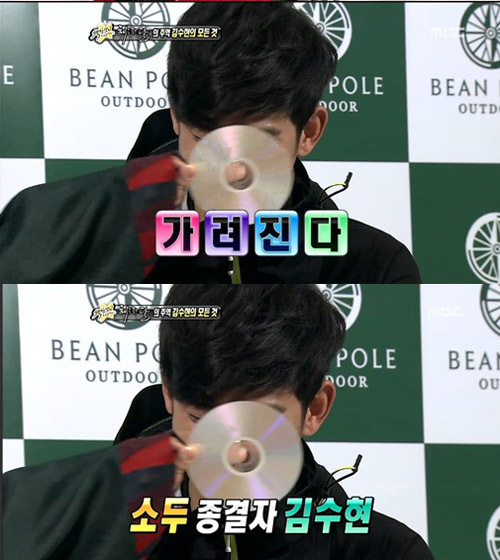 Although Kim Soo Hyun seemed to be a bit flustered, but he expressed that there was no CD on the scene but it’s possible to use a hat as big as CD. Unexpectedly the MC has prepared a CD in advance. The small face of Kim Soo Hyun passed the validation of CD following the validation by the bowl previously. Netizens commented, “Really small, on TV also this small, in reality how small is it” and so on.